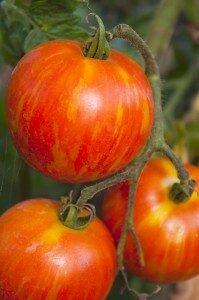 Sweet, delicious Sun Gold tomatoes prove that hybrids can have a ton of flavor. A hybrid vegetable is created when plant breeders intentionally cross-pollinate two different varieties of a plant, aiming to produce an offspring, or hybrid, that contains the best traits of each of the parents. Cross-pollination is a natural process that occurs within members of the same plant species. In hybridization, pollination is carefully controlled to ensure that the right plants are crossed to achieve the desired combination of characteristics, such as bigger size or better disease resistance. The process of developing a hybrid typically requires many years. One example is Juliet, a 1999 All America Selections winner. This Roma-style grape tomato offers great taste and productivity along with improved disease resistance to increase success in the garden. Another is Sun Gold, a prolific yellow cherry tomato that’s so sweet and delicious, it’s like candy from the garden. In general, hybrids offer some combination of these favorable traits: dependability, less required care, early maturity, better yield, improved flavor, specific plant size, and/or disease resistance. Hybrid vegetables typically look like the veggies you’d find at a supermarket. GMO plants, on the other hand, are the result of genetic engineering. (“GMO” stands for “genetically modified organism.”) This is a process during which the plant’s DNA is altered in a way that cannot occur naturally, and sometimes includes the insertion of genes from other species. All of our plants are grown from non-GMO seeds. 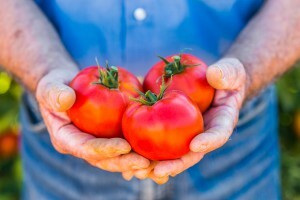 Many people have grown the same heirloom tomatoes for many decades. 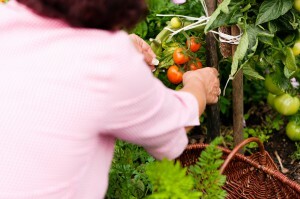 Heirlooms come from seed that has been handed down for generations in a particular region or area, hand-selected by gardeners for a special trait. Heirloom vegetables are open-pollinated, which means they’re pollinated by insects or wind without human intervention. How experts define heirlooms can vary, but typically they are at least 50 years old, and are often pre-WWII varieties. In addition, they tend to remain stable in their characteristics from one year to the next. Many gardeners agree that most heirloom varieties boast greater flavor than that found in hybrids, especially among tomatoes. Bonnie’s heirloom tomato varieties are clearly marked on the plant tags and trays. While hybrid plants typically yield a crop that is uniform in both appearance and timing, heirloom vegetables produce a “mixed bag” harvest. The harvest may come in less predictably, and fruit size can vary greatly even on the same plant. Despite their sometimes odd looks and quirky ways, heirlooms bring lots to the table (literally!). The Amish heirloom tomato Pink Brandywine, for example, yields fruit with an unbeatable flavor in shades reminiscent of a glass of Cabernet. Arkansas Traveler, a Southern favorite, originated in Northwest Arkansas prior to 1900 and gradually found its way across the South to North Carolina. Resistant to cracking and disease, this beauty yields delicious tomatoes under typical Southern summer conditions–high heat, high humidity, and drought. In the battle of hybrid vs. GMO vs. heirloom plants, we suggest growing both hybrid and heirloom vegetables (especially tomatoes!). Doing so will ensure a reliable, flavorful harvest that offers a lot of variety and, truly, the best of both worlds. This entry was posted on Tuesday, April 16th, 2019 at 3:25 pm	and is filed under News & Updates. You can follow any responses to this entry through the RSS 2.0 feed. You can skip to the end and leave a response. Pinging is currently not allowed.